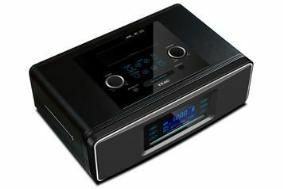 TEAC introduces SR-3DAB radio/CD player with iPod dock | What Hi-Fi? Housed in a wooden cabinet with a black, leather-effect finish, the SR-3DAB is designed for use in the bedroom, kitchen, study or living room. As well as having a built-in iPod dock, it also has a 3.5mm stereo input for connecting other portable players, can play MP3 files on a CD or from a USB flash storage device or SD card, and includes a clock with a dual alarm.